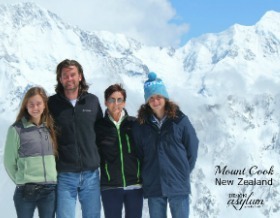 was definitely one of the highlights of our family trip around New Zealand. You can read more about how we came to spend three weeks in New Zealand here. We could not get over how beautiful this place was. This is a picture I took while riding the gondola down the mountain. I sat in the wonderful cafe and had delicious coffee. It was pretty chilly. Mountain Biking at the Skyline. Moto-Boy rented a mountain bike and rode the mountains for half of a day. This was cool. 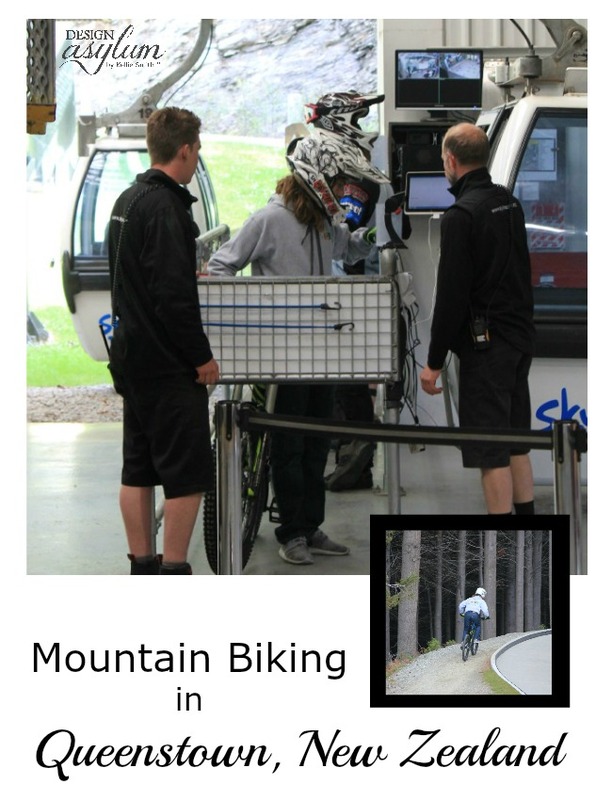 The Skyline gondolas were equipped with bike racks so they could haul the bikes up to the top of the mountain and the riders rode them down. With the purchase of a day-pass, you could get in as many rides as you wanted in your alotted bought time. It was pretty high-tech. They took your photo and created an I.D.. Every time you came through, you just swiped the I.D. card. I rode up the first time with Moto-Boy, made sure of what was going on, rode back down and waited for him to come to the bottom for the first time. He said it was ‘all good’, so I took a 5 minute stroll to downtown and walked through the many, many shops. Good grief, I could have dropped some bucks. Cool stores. While Moto-Boy was on the bike trail, Rider-Girl was on the horse trail. Horseback Riding with Dart Stables. 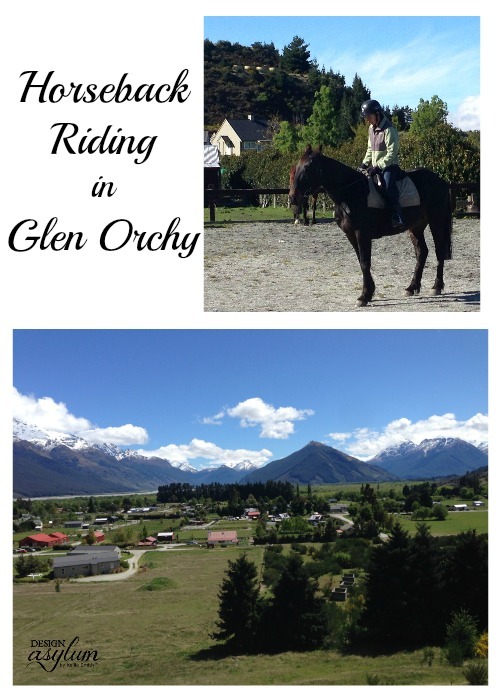 The BHE took the gorgeous 45-minute drive to Glen Orchy so R-G could go horseback riding. R-G rode through the trails and the BHE found a place to nap in the sunshine. Rider-Girl loved this. I can only imagine the gorgeous views she saw! Can I just tell you that the BHE really outdid himself on this one? We stayed in a penthouse. A penthouse! It was for sell at the time we were there for a cool 1.3 million or something crazy like that! And here’s the million dollar view. It offered amazing views of the city and was located a block off of downtown. It was the perfect location no matter where you wanted to go. Close enough to walk to the gondolas, restaurants, or shops, yet not right in the middle of downtown if we wanted to take the car out easily. We ate at a delicious Italian Restaurant Bella Cucina. The fam did the Fear Factor haunted house. No, I did not. You pay people to scare you? They also did the Shotover Jet. Nope, not for me either. It’s a speed boat ride at 9000 mph (ok, not really 9000) through a canyon and rocks. They said they loved it but I didn’t really think the people that might sit behind would like vomit in their face so I enjoyed a nap on the patio. They bought the video of their ride for me to watch. It was crazy!! 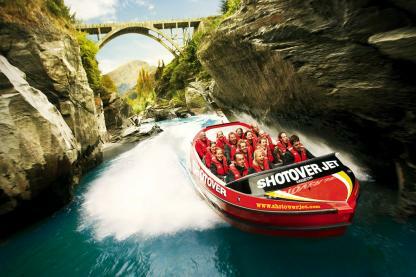 Here’s a picture from the Shotover Jet website. 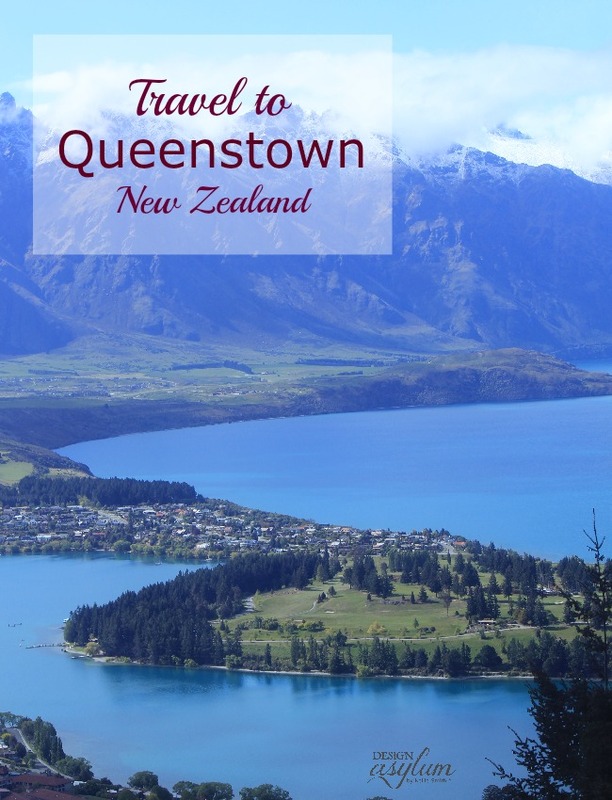 Queenstown was definitely everyone’s favorite city. But, wow, every city we visited on our journey was amazing in its own way. 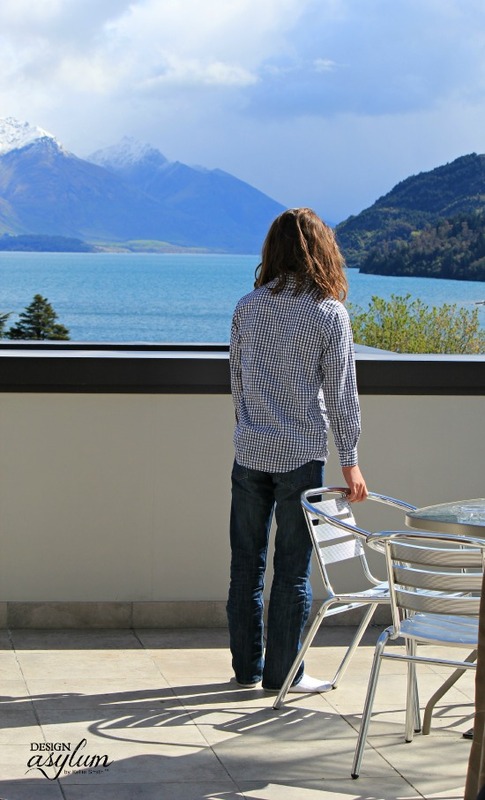 Queenstown, however, was like this crescendo of everything we loved about New Zealand. 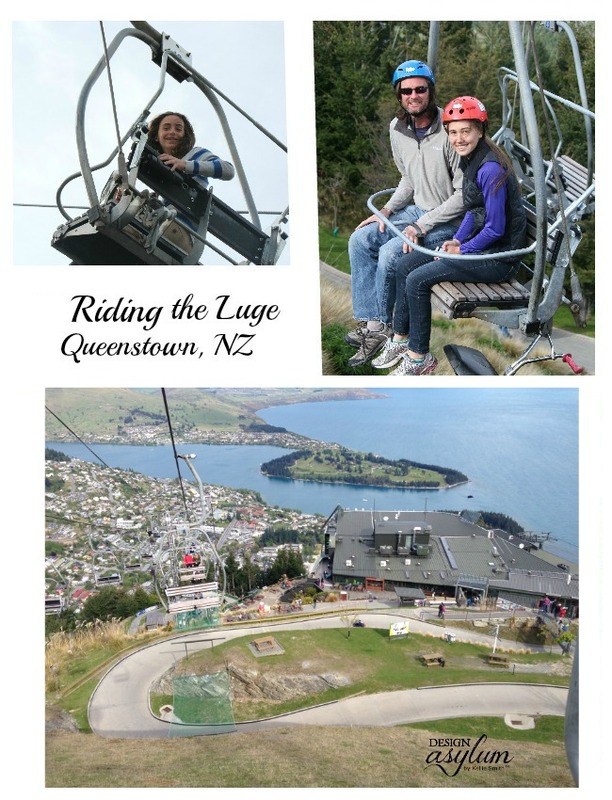 Read about how we came to spend three weeks in New Zealand here. I think it was because it was part modern city, part amazing mountains, part gorgeous lake. It was really the best of all worlds. The city was teaming with young people from the University. The vibe was hip and outdoorsy and healthy, since we like to go outside and exercise and also use supplements as the one from this SalusStructuredSilver review to have energy for this. Moto-Boy thinks he’s going to College there. Wow it is so beautiful! It actually kind of reminds me of what Utah looks like! Oh cool Lauryn, I haven’t been to Utah in 2o years but I must return, I do remember being incredibly gorgeous!! New Zealand is on my dream list! Your pictures are so beautiful. You really captured the city and the fun you had. Now I really have to make sure I get to NZ! Honestly Traci, NZ was never really on my radar but the opportunity presented itself and, of course, we went!! 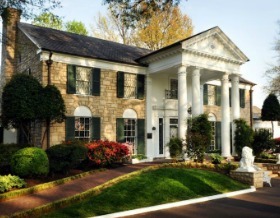 Now, I think it needs to be on everyone’s list of places to see. You will love it! Looks like your guys had a lovely trip – the pictures are beautiful! And I loved the acronym – hilarious! Thank you Jessica! It really was an amazing trip. 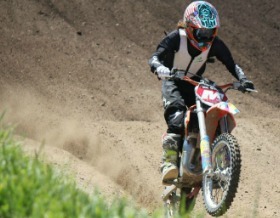 And seriously, moto-boy has big dreams and they aren’t cheap! Lol! !